The San Joaquin Valley (also referred to as “SJV” and “the Valley”) is California’s agricultural powerhouse, shipping produce all over the world and contributing billions of dollars to the state’s economy. However, despite the abundance created in the Valley, the scarcity of resource reinvestment and lack of economic benefits to local communities leaves pervasive poverty. Moreover, the unsustainable practices of conventional industrial agriculture have detrimental impacts on the natural environment, leaving the Valley with severely polluted air, water and soil. The conservatism of the Valley’s political representatives has favored industry over our residents and natural environment, slowing the progress of public policy toward a diversified and economically viable future would enhance the wellbeing of our communities. The time for change is now. 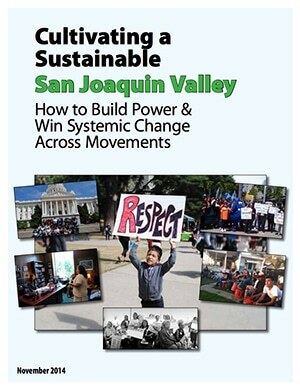 We have the opportunity to build on generations of successful community organizing and movement building in the SJV. Local communities and organizations are poised to escalate our political power and influence to more effectively catalyze greater change regionally and statewide.